On 5th May 2018, Duhok Province in Northern Iraq experienced a massive flood due to a series of heavy rains at the beginning of the month. Four lives were lost in the City of Duhok where PWJ field office is located, and many residents living by the river were forced to evacuate and seek shelter for safety at their relatives’ as well as nearby schools. The heavy rain continued on to 8th and 9th May, causing serious damages in different parts of Duhok Province. Many of the households living by the river were low-income families, with the structure of their houses being already susceptible to natural disasters such as heavy rain and flood. 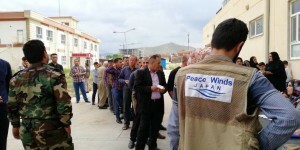 Based on the assessment in cooperation with the local government, on May 10th, in Zakho, North-western district, PWJ provided emergency relief assistance (blankets, pillows and mattresses) to 65 households (450 people), the families particularly vulnerable such as female-headed households and low-income households that were affected by the flood and that had lost their properties. PWJ in Northern Iraq is implementing humanitarian assistance for the conflict-affected population through various sectors including education, water and sanitation, and electricity network improvement, which are all essential to the reconstruction of their living environment. During the harsh summer, the weather in the area reaches 40-50C (98-120F), and PWJ also plans to respond to the humanitarian needs by distributing non-food items such as air coolers and summer clothes to vulnerable communities. This project is made possible with your support and the assistance from the Japan Platform（http://www.japanplatform.org/E/）.